Boise State University senior men’s tennis player Andrew Bettles from Somerset, England breezed to the Men’s Open singles championship of the 2013 Lyle Pearson Labor Day Tennis Championships Sunday, Sept. 1 at Sun Valley Tennis Club. Top-seeded Bettles, 20, a 6-1 right-hander, won four matches in straight sets including his 6-2, 6-4 championship match triumph over BSU 6-2 redshirt junior Aidan Reid of Monument, Colo. In Sunday’s semi-finals of the 17-player Open singles class, Bettles needed only two sets to beat 6-2 BSU sophomore Thomas Tenreiro from Miami, Fla.
Ranked No. 36 nationally in Men’s Singles last June by the Intercollegiate Tennis Association, Bettles (30-10 singles, 16-11 doubles) became only the 11th BSU player to reach the NCAA Division 1 men’s singles tournament. He lost his first-round match 6-2, 6-4 to USC All-American Yannick Hanfmann (31-7) at Champaign, Ill. Still, BSU coach Greg Patton has called Mountain West “Player of the Year” Bettles one of the best players in school history, calling him tenacious and relentless and capable of bigger things in this, his senior year. Another collegiate star, 21-year-old Jitka “Joker” Gavdunova of the Czech Republic, easily won the Lyle Pearson Women’s Open singles class last weekend—beating Erin Pfaeffle of Ketchum and Wood River High School junior Haley Cutler in round-robin action. Gavdunova, hailing now from Bainbridge Island, Wash., starred for the Francis Marion University Patriots in Florence, S.C. from 2009-12. As a senior in 2012, the two-time Patriots MVP was ranked No. 11 among NCAA Division 2 women in singles. Men’s Open doubles winners were BSU players James “JP” Boyd of Rancho Santa Fe, Ca. and Thomas Tenreiro, both strong underclassmen. A sizable number of local players took part in the three-day U.S.T.A. Intermountain competition presented by Sun Valley Resort and sponsored by Atkinsons’ Market and Lyle Pearson of Boise. Judith Steinbock of Sun Valley won Women’s 3.5 singles 6-3, 6-3 over Rebecca Kochvar of Boise. Raleigh Grossbaum of Ketchum, the 2012 State 4A boys’ doubles champion from Wood River, won the Men’s Open doubles consolation title with BSU assistant tennis coach Luke Shields. Two exciting matches involved local players in Women’s 4.0 doubles. 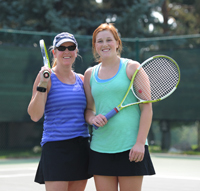 The winning mother-daughter team of Boise’s Chelsea Cutler and Wood River’s Haley Cutler won the title 6-7, 6-1, 16-14 over Boise players Jenny Grunke and Mary Stone-Arave. In the semi-finals, the Cutlers held on to nip Nancy Wasilewski of Ketchum and Lana Penrose of Henderson, Nev. 6-4, 6-7, 10-4. Wasilewski-Penrose then grabbed the consolation title 6-4, 1-6, 12-10 over Jennifer Embree and Mary Foust. Men's Open championship—Andrew Bettles of Somerset, England 6-2, 6-4 over Aidan Reid of Monument, Co.
Consolation final—Tyler Neill of Pocatello 6-2, 6-2 over Vjekoslav Bampa of Twin Falls (17 players). NTRP (National Tennis Rating Program) Men's 4.5 championship—John Armstrong of Boise, last year’s Lyle Pearson Labor Day Men’s 5.0 singles winner, made it a Labor Day three-peat 6-1, 7-6 over James Musil of Flower Mound, Tex. Consolation final—Kory Putnam of Buhl 6-2, 6-1 over Andrew Pearson (6 players). NTRP Men's 4.0 championship—Dallin Young of Twin Falls 7-5, 6-7, 6-4 over Brent Bungard of Boise. Consolation final—Larry Schwartz of Hailey 6-1, 6-1 over Ira Shepard of Ketchum. Also in the Main Draw, Daniel DuFur of Sun Valley won twice before falling to Dallin Young 6-2, 6-3 in the semi-finals (12 players). NTRP Men's 3.5 championship—John Dornfield 7-6, 6-2 over Steve Olmstead of Meridian. Consolation final—James Quinn of Boise 1-6, 7-5, 10-8 over John Roberts of Twin Falls (7 players). Women's Open championship—Jitka Gavdunova of Bainbridge Island, Wash. won the round-robin in straight sets over second-place Erin Pfaeffle of Ketchum and third-place Haley Cutler of Boise, a Wood River High School junior (3 players). NTRP Women's 4.0 championship—Karen Strahler of Boise 4-6, 6-1, 6-2 over Christa Patton of Boise. Consolation final—Nicole Griebe of Star 7-5, 6-2 over Mary Foust of Sausalito, Ca. (5 players). NTRP Women's 3.5 championship—Judith Steinbock of Sun Valley 6-3, 6-3 over Rebecca Kochvar of Boise. Consolation final—Stephanie McDonald of Boise 6-4, 6-0 over Katie Debicki of Granger, Indiana (8 players). Men's Open championship—James Boyd of Rancho Santa Fe, Ca. and Thomas Tenreiro of Miami, Fla. 8-5 pro-set win over Garrett Patton of Boise and Aidan Reid of Monument, Co.
Consolation final—Raleigh Grossbaum of Ketchum and Luke Shields of Grand Junction, Co. 6-4, 7-5 over Bjorn Eide of Idaho Falls and Peter Samway of Sun Valley (8 teams). NTRP Men's 4.5 championship—First place: James Musil of Flower Mound, Tex. and L.R. Williams. Second place: Vjekoslav Bampa and Duncan Roberts of Twin Falls. Third place: Doug Dufur and Daniel DuFur of Sun Valley (3 teams, round robin). NTRP Men's 4.0 championship—John Evans of Burley and Robert Welch of Twin Falls 7-5, 6-1 over A.H. Alexander of Sun Valley and Justin Walker of Nampa. Consolation final—Joe Daley of Spokane, Wash. and David Taylor 6-1, 6-0 over Kyle Kester of Boise and Ryan Kester of New York (5 teams). NTRP Men's 3.5 championship—Matt Long and Kevin McDonald of Boise 6-1, 6-3 over over Richard Arave and James Vavrek of Boise. Consolation final—Sherman Leibow and Andy Stento of Boise 6-1, 6-2 over Matt Ivanoff and Kent Ivanoff of Boise (6 teams). NTRP Women's 4.0 championship—Haley Cutler and Chelsea Cutler of Boise 6-7, 6-1, 16-14 over Jenny Grunke and Mary Stone-Arave of Boise. Consolation final—Nancy Wasilewski of Ketchum and Lana Penrose of Henderson, Nev. 6-4, 1-6, 12-10 over Jennifer Embree and Mary Foust of Sausalito, Ca. (6 teams). NTRP Women's 3.5 championship—Theresa Mansfield of Pocatello and Valeria Rodel of Idaho Falls 6-2, 6-3 over Jamie Cilley of Meridian and Hilary Grounds of Eagle. Consolation final—Nancy Wasilewski of Ketchum and Cheryle Daley of Spokane, Wash. 6-3, 6-2 over Nancy Auseklis of Sun Valley and Patti Onken of Mesa, Az. (8 teams). NTRP Mixed 8.5 championship—Michael Megale and Kimberlee Megale of Boise 6-4, 6-3 over Joe Writer of Boise and Amanda Alexander of Sun Valley. Consolation final—Brent Bungard and Karen Strahler of Boise 6-4, 7-5 over Greg Patton and Chelsea Patton of Boise (7 teams). NTRP Mixed 7.5 championship—John Armstrong and Sunny Poppler of Boise 6-4, 6-4 over Steve Olmstead of Meridian and Nicola Griebe of Star. Consolation final—Wood River High School tennis coach Carlos Meza of Jerome and Chelsea Cutler of Boise 6-1, 6-7, 11-9 over Dave Weese and Lana Penrose of Henderson, Nev. (8 teams). NTRP Mixed 6.5 championship—First place: Gary Lim and Laura Lim of Eagle. Second place: James Quinn and Leanne Quinn of Boise. Third place: Luke Rodel and Valeria Rodel of Idaho Falls (3 teams, round robin).